The right may has old roots and worthy goals and a meaning that judges, legislators and lawyers still grapple with. The principle that a delay in bringing an accused person to trial in a reasonably short period of time serves justice, both for the accused and for society, is universally accepted. Meeting that principle in practice has presented difficult problems. In 1166, nearly 850 years ago King Henry II of England laid out rudimentary rules of both criminal and civil procedure. These rules were designated the Assize of Clarendon. The rules consisted of 22 provisions for the conduct of the king’s courts. Number four contained the basic concept that an accused person should promptly be brought before a judge and his case heard quickly. In the 12th Century, the king appointed judges who would travel around the kingdom to hear cases, and a judge was not always available to address criminal questions. The Assize of Clarendon ordered that a judge be found and an accused’s case be heard. The “we” in the provision refers to King John, who agreed to the Magna Carta under threat of revolt by the English nobility. Over 400 years later, in 1642, Sir Edward Coke concluded that English judges were required to give a prisoner “full and speedy justice” to avoid the evil of lengthy pretrial detention. This history would ultimately find its way to the American Bill of Rights in 1791. The idea that “justice delayed is justice denied” is ancient. Yet the real meaning of “speedy trial” has been elusive. In 1972, over 810 years after the Assize of Clarendon, the United States Supreme Court grappled with the problem in Barker v. Wingo, and developed a four part test to determine if an accused’s constitutional right to a speedy trial had been violated. Despite the fact that the defendant in Barker v. Wingo was not tried until five years after his arrest, the Court determined there had been no constitutional violation. In 2013, the Court in Boyer v. Louisiana agreed with the state of Louisiana that a seven year delay, primarily due to the fact that Louisiana did not provide funds for an accused’s defense, was not a violation of the Sixth Amendment right to a “speedy trial”. In 1974, Congress passed the Speedy Trial Act that applies to persons accused of federal crimes. Every state has either state constitutional or statutory provisions that apply to persons accused of state crimes. 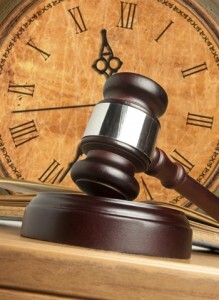 These provisions provide complex computations as to when the “time” for a trial has passed and a case must be dismissed. The computations generally start with a defined time period, for example 180 days from arrest to trial. Generally, a defendant must “demand” a speedy trial for these time periods to run, and even then, certain delays, such as a continuance requested by the defendant do not count in the time calculation. Since the only remedy approved by the Supreme Court for a violation of the constitutional right to a speedy trial is dismissal of the charges and the calculations are often complex and open to interpretation, few cases are dismissed on speedy trial grounds. The goals of the speedy trial clause are worthy and serve both the interest of the defendant and the public. The idea of bringing an accused to trial in a “timely” manner is nearly nine centuries old. There are universally accepted goals behind the idea. A straightforward means of meeting those goals remains elusive. The Virginia Declaration of Rights had an impact both upon the ultimate United States Bill of Rights and The Declaration of Independence. The Sixth Amendment “speedy trial” clause originally applied to just the federal government. Through the “incorporation” of most of the Bill of Rights by the Fourteenth Amendment, it now applies to the states as well.